How desperate is the spy thriller set for a good villain now that the Cold War is over? Well, it's to the point that in Dale Brown's latest, "Fatal Terrain," the nemesis is communist China, a nation with no ICBMs that can hit the heart of the United States, no navy to speak of, and an air force that would have a hard time taking on the California Air National Guard. 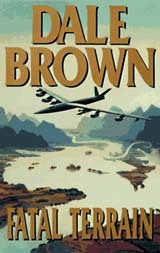 Although Brown makes a game effort at turning mainland China into a real threat, the stretches of imagination get sillier and sillier until his book collapses into a sort of self-parody. Oh, well. The infinitely more talented Tom Clancy hasn't fared much better of late, resorting to turning Japan into a rogue power simply to keep his hero Jack Ryan going  all the way to the White House. And while Brown clearly emulates Clancy, he is a working-class version at best. But Brown is not nearly as talented a writer as Clancy. While no Hemingway, Clancy nevertheless can write an engaging bit of adventure. Brown is much more likely to engage in clichés, to create simplistic good guy/bad guy scenarios, and to stretch reality far past the breaking point. In Brown's latest, "Fatal Terrain," we once again have McLanahan and his group of Air Force renegades and private contractors modifying an aging B-52, making it into the world's most powerful weapons platform, more so even than an aircraft carrier. It's more a fixation than a theme, given that Brown has been reworking B-52s since his first book, "Flight of the Old Dog," back in the '80s. The plot  such as it is  this time out revolves around Taiwan declaring itself a separate nation from China. Beijing responds by nuking Taiwan, the Democrats controlling Congress refuse to back the Republican president, and, of course, the fate of the free world rests on the shoulders of McLanahan. If possible, the dialogue is even flatter than the storyline. The characters are all shallow, either pure evil or pure good. In fact, the only interesting character is the renegade Chinese admiral who masterminds the attacks on Taiwan, convincing the liberal Western media (they're evil, of course) that the United States launched the nukes, not China. In the end, you almost wish the Chinese would win just so Adm. Sun Ji Guoming could cause more trouble in a future book.